Our junior fencing course is for children only aged from about 7 to 12 years old and the class size is just over a dozen. 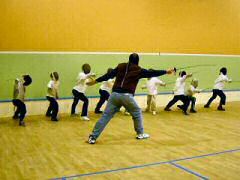 The junior fencing course is from 9:00 am to 10:30 am and usually runs for a 10-week term. Our cadet fencing course is for children aged from about 12 to 15 years old and the class size is just over a dozen. The cadet fencing course is from 10:30 am to 12:00 pm and usually runs for a 10-week term.